Leaked beta footage suggests that BioWare's newest title replaces easy/normal/hard with action/story/RPG. For a short time on Xbox Live, gamers beta testing the new Xbox dashboard were mistakenly given access to a private beta of Mass Effect 3. Though Microsoft realized and remedied the mistake quickly, multiple users were able to download the 1.8GB package before it was pulled. 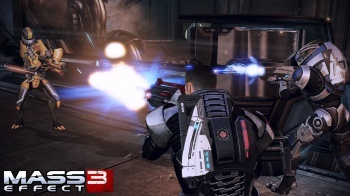 Mass Effect 3 producer Jesse Houston responded to the leak on the official BioWare forum. "As most of you know by now," he wrote, "this evening an accidental leak occurred of some early Mass Effect 3 beta code. " "We'd like to stress that the leaked code is in a rough, unfinished state and was not meant for public release," Houston continued. "The content is not final, and is not reflective of the quality of the finished, polished game due for release on March 6, 2012." While the mechanics and graphics may not yet be final, solid game information was still released that presumably won't change before players get their mitts on it. Screenshots and videos of the beta have already begun circulating through the internet, revealing multiplayer character creation, stats screens, and mission segments. Also outlined were the three game modes, including Action, Story, and RPG mode. The beta describes "Action mode" as being "for those who want to emphasize action and combat and minimize story management. Action mode will set automatic replies in conversation and a normal difficulty." "Story mode" will be "for those who want to emphasize story immersion and minimize combat pressure. Story mode will set manually-selectable replies in conversation and a minimal combat difficulty." And finally, "RPG mode" is "for those who want to explore both realms of story and combat. RPG mode will set manually-selectable replies in conversation and a normal combat difficulty." While these three new modes are a clever twist on the usual easy, normal, and hard settings we're used to, I think it's more demonstrative of an attempt by BioWare to placate as many fans of its popular Mass Effect series as possible. The first Mass Effect's design heavily embraced a bevy of RPG elements, while the second moved to streamline them for a more visceral shooter-style combat. It seems as though BioWare may now be trying to accomidate both styles with these new modes, but we'll only know if it worked (or was actually included at all) come March of next year when the final version of the game is released.